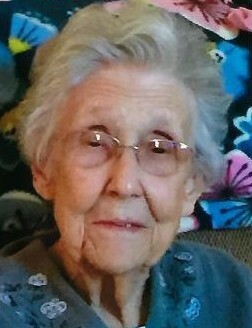 Obituary for Margaret Louise "Peggy" (Ward) Stevens | McCoy-Moore Funeral Home Inc.
Margaret Louise “Peggy” Stevens, 90, Vinton, Ohio passed away Saturday April 6, 2019 at the home of her daughter Ann Potts. She was a retired Postal Clerk for the U. S. Post Office in Vinton, Ohio and had served as Clerk for the Vinton Memorial Park Cemetery for many years. She was a member of the American Legion Auxiliary Post 161, Ewington, Ohio and a member of the Ohio Eastern Star Chapter 375 at Vinton, Ohio. Peggy was born January 9, 1929 at Vinton, daughter of the late Emmett Ward and Ermel Lloyd Ward. She married John L. Stevens July 23, 1947 at Bidwell, Ohio and he preceded her in death July 6, 2001. Also preceding her death were two brothers, Lloyd Ward and David Ward and special friends, Cline and Mabel Gerlach. She is survived by two daughters: Ann (Tom) Potts, Vinton, Ohio and Jan (Tim) Demosky, Albany, Ohio and four grandchildren: John (Jenny) Wells and Jason (Wendy) Wells, both of Vinton Ohio; Danny (Samantha) Rees, Bonner Springs, Kansas and David (Mica) Rees, Pomeroy, Ohio. Also surviving are great-grandchildren: Jacob, Jarrett and Jessica Wells; Matthew Belville, Michael Wells, Hannah, Ben and Garrett Rees; sister, Shelba Wood, Columbus, Ohio and special friends: Danny Browning, Vinton, Ohio and Ruth Ann Greenlee, Bidwell, Ohio. Funeral services will be conducted 11:00 AM Tuesday April 9, 2019 in the McCoy-Moore Funeral Home, Vinton, with Pastor Robert Powell officiating. Burial will follow in the Vinton Memorial Park Cemetery. Friends may call at the funeral home Monday 5:00 – 8:00 PM. Eastern Star services will be conducted 7:45 PM Monday at the funeral home by Vinton O.E.S Chapter 375. In lieu of flowers, the family requests memorial donations be made to Heartland Hospice, 315 Washington St. Unit B, Oak Hill, Ohio 45656.